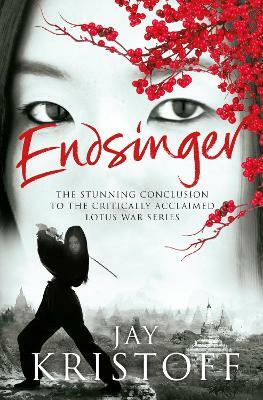 An exciting, vivid conclusion to Jay Kristoff's critically acclaimed Lotus War Trilogy. Following Stormdancer and Kinslayer, Endsinger is sure to have fans racing through the pages to savor every last revelation. A trembling earth: The flames of civil war sweep across the Shima Imperium. Blood turns against blood as the Dragon and Fox clans compete for the empty throne. With their plans to renew the Kazumitsu dynasty foiled, the Lotus Guild unleash their deadliest creation - a mechanical goliath known as the Earthcrusher, intended to force the shattered Empire under a yoke of fear. With the Tiger Clan and their puppet Daimyo Hiro in tow, the Guild marches toward a battle for absolute dominion over the Isles. A broken rebellion: Yukiko and Buruu are forced to take leadership of the Kage rebellion, gathering new allies and old friends in an effort to unite the country against the chi-mongers. But the ghosts of Buruu's past stand between them and the army they need, and Kin's betrayal has destroyed all trust among their allies. When a new foe joins the war tearing the Imperium apart, it will be all the pair can do to muster the strength to fight, let alone win. A final battle: The traitor Kin walks the halls of Guild power, his destiny only a bloody knife-stroke away. Hana and Yoshi struggle to find their place in a world now looking to them as heroes. Secret cabals within the Lotus Guild claw and struggle; one toward darkness, the other toward light. And as the earth splits asunder, as armies destroy each other for rule over an empire of lifeless ash and the final secret about blood lotus is revealed, the people of Shima will learn one last, horrifying truth. There is nothing a mother will not do to keep her children by her side . . .
Jay Kristoff grew up in the most isolated capital city on earth and fled at his earliest convenience. A bestselling author of fantasy and science fiction, including the Lotus War Trilogy, he worked in 'creative advertising' for eleven years and has won several awards that nobody outside the advertising industry gives a tinker's cuss about. He is 6'7, has approximately 13870 days to live, and can demand whiskey in almost a dozen European languages. He lives in Melbourne with his wife and the world's laziest Jack Russell.